I like to take on artsy-crafty projects, but that doesn’t mean I’m always good at them. My pumpkin snowman is a good example of a recent craft fail. While the intent was good, it just didn’t come together for me the way I wanted it to. The idea was pretty simple: Paint three pumpkins white, then stack them, draw on a face, and and a scarf and a hat. The problems started with the paint. I bought a white craft paint thinking it would work. But as husband pointed out, the pumpkins probably needed a primer first to help cover the orange. After 5 or 6 coats, I figured they were as white as they were going to get. 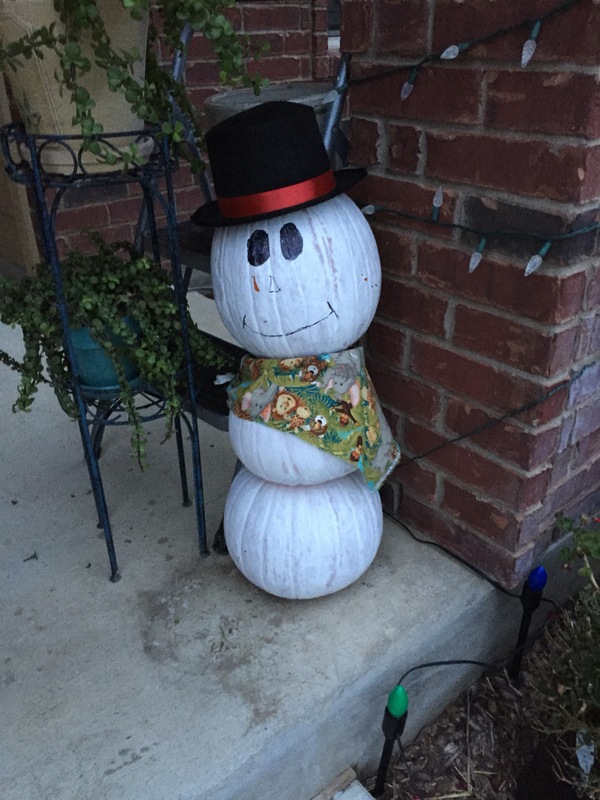 Getting the three pumpkins to look like a snowman was easier said than done, too. It’s not like I could change the sizes to more snowball-shaped sizes; I had to work with what I had. The “face” pumpkin was very unstable sitting atop the other two, so I had to put something behind them to act as an anchor. Hopefully, the plant stand sort of covers the stepstool behind the pumpkins. It took me awhile to figure out how to attach the hat to the top pumpkin, too. It gets pretty windy, and I don’t want it to blow away easily. I ended up pounding two small nails through the brim and into the pumpkin. With temperatures likely to hit the mid- to high-70s this week, the pumpkins won’t last long anyway. When they start getting soft, I’ll just toss them. Or maybe, like Frosty, they’ll just melt away. You are sweet. But I think most fourth-graders could have done a better job! Aw no, I love it!